Gotosearches.com is the PUP that uses misleading techniques to prevent removal. Use Reimage to locate malicious components and get rid of them faster than with uninstall instructions. A full system scan blocks virus reappearance and prevents traffic to malicious domains. Why I can't remove Gotosearches.com from my browser? How can I stop browser hijackers before they enter my computer system? How to remove Gotosearches.com from my browser? Why I can’t remove Gotosearches.com from my browser? Gotosearches.com virus appears to be published by Elex do Brasil Participações Ltda. Although it is not a malicious application, security experts name it as potentially unwanted program (PUP) that shouldn’t stay on the computer for long. This program is made to change homepage settings in all main web browsers and set Gotosearches.com as a new tab page (and also homepage) address. This URL points to a search engine that looks suspicious. What is more, we have opened website’s Terms and Conditions page and discovered that Elex do Brasil Participações admits to be integrating links for third-party websites, applications, advertisements into the website, which means that the vast of search results generated by GoToSearches might be sponsored. The company also claims that it doesn’t endorse content of third-party websites that it includes links to, so better be careful! Such websites commonly appear to be dangerous. Sometimes, they hide malicious links in them, or suggest installing unpleasant ad-supported applications or browser toolbars that simply diminish the quality of browsing or make computer programs lag. 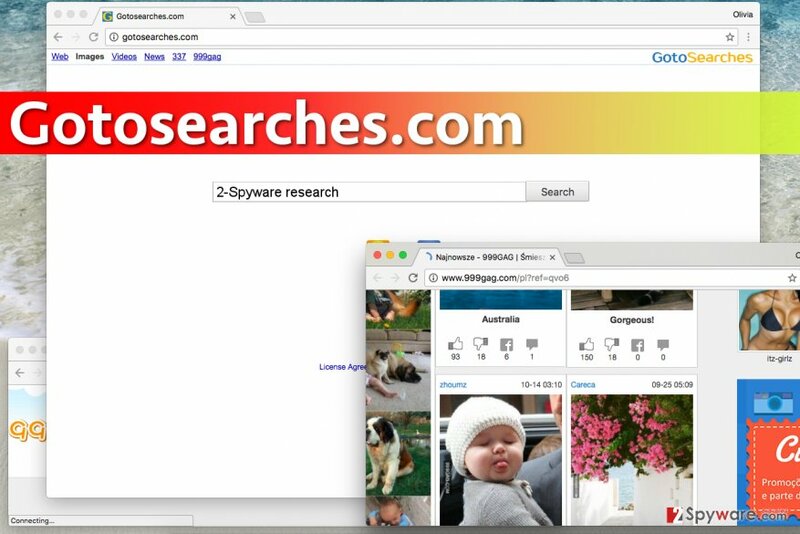 In this picture, you can see the search engine that Gotosearches.com redirect virus promotes. If this suspicious URL crowned itself as the default page and search engine in your Internet browsers, you shouldn’t ignore it. It means that a few suspicious browser extensions could find a way to your system unnoticed, the same can be said about a few suspicious applications. Therefore, we suggest you quickly scan the system with Reimage or similar software to find out what spyware or malware programs are hiding their presence. Using anti-spyware software is the best way to remove Gotosearches.com redirect virus, but if you believe that you can uninstall this browser hijacker manually, we highly recommend using Gotosearches.com removal instructions that we have prepared. Browser hijackers like Gotosearches.com hijack the system when installed along with other free programs. Therefore, you should be attentive and carefully select proper installation settings everytime you launch a program’s setup. Information written in fine print is very important, and you can usually find some info written behind Default or Standard settings. This information frequently discloses what third-party programs will be installed along with your download. These programs typically are useless ad-supported utilities that you definitely do not need in your computer system. To install your chosen program without these additions, choose Custom or Advanced installation settings and deselect these extra programs. Repeat this step every time you download a piece of software from the Internet, and you will keep the majority of PUPs away from your device. If you do not know how to remove Gotosearches.com virus, you should read some information about browser hijackers to understand better how they operate. You can also use this detailed Gotosearches.com removal guide, which is provided down below. Speaking about removal methods, we must say that manual removal option is a good choice, but automatic removal method is an even better choice. Using anti-spyware program can help you to clean your computer much faster and remove all spyware and malware programs from the system at once. First of all, your system might contain programs associated with this browser hijacker. You might also find some programs that initiate other unpleasant activities, for example, display annoying pop-up ads. Therefore, you are advised to check these instructions and remove unwanted programs from the system. Here, look for Gotosearches.com or any other recently installed suspicious programs. Wait until you see Applications folder and look for Gotosearches.com or any other suspicious programs on it. Now right click on every of such entries and select Move to Trash. When in the new window, check Delete personal settings and select Reset again to complete Gotosearches.com removal. Once these steps are finished, Gotosearches.com should be removed from your Microsoft Edge browser. Here, select Gotosearches.com and other questionable plugins. Click Remove to delete these entries. Now you will see Reset Firefox to its default state message with Reset Firefox button. Click this button for several times and complete Gotosearches.com removal. Chrome Browser is one of web browsers that are vulnerable to browser hijacking. We suggest you check these instructions out – we are sure that you will find them helpful. Here, select Gotosearches.com and other malicious plugins and select trash icon to delete these entries. Click Reset to confirm this action and complete Gotosearches.com removal. Here, select Extensions and look for Gotosearches.com or other suspicious entries. Click on the Uninstall button to get rid each of them. Here, look at the Homepage field. If it was altered by Gotosearches.com, remove unwanted link and enter the one that you want to use for your searches. Remember to include the "http://" before typing in the address of the page. Now you will see a detailed dialog window filled with reset options. All of those options are usually checked, but you can specify which of them you want to reset. Click the Reset button to complete Gotosearches.com removal process. ^ Michael King. How to Change Your Web Browser Home Page. PCWorld - News, tips and reviews from the experts on PCs, Windows, and more. ^ Terms of service. Wikipedia. The Free Encyclopedia. ^ Daniel C. Fain, Jan O. Pedersen. Definition. Google Scholar: Sponsored Search: a Brief History. ^ Fine Print. Wikipedia. The Free Encyclopedia. ^ Information about browser hijacker and removal instructions. NoVirus. 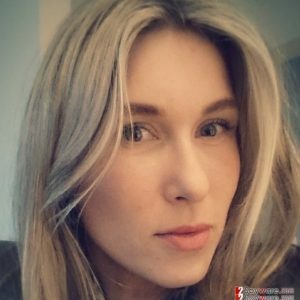 Website that helps computer users remove malware. This entry was posted on 2017-01-27 at 02:15 and is filed under Stealing programs, Viruses. You can quickly scan the QR code with your mobile device and have Gotosearches.com virus manual removal instructions right in your pocket. How did you remove Gotosearches.com virus?